TRYON, N.C. (June 25, 2014) – Mark Bellissimo, managing partner of Tryon Equestrian Partners, today announced plans to create the most significant new equestrian lifestyle destination in the world, as well as engage Sheila C. Johnson’s Salamander Hotels & Resorts – one of the country’s top luxury hotel management companies – to assist with the development and management of hospitality and golf operations. The world-class Tryon Resort is a 1,400-acre retreat which features the brand-new Tryon International Equestrian Center. 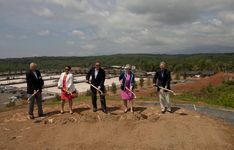 Located in the rolling, picturesque foothills of North Carolina’s Blue Ridge Mountain Range and surrounded by numerous year-round activities, the project has already created hundreds of new construction jobs, and will contribute hundreds of permanent jobs and tens of millions of dollars to the local economy and tax base. Tryon Equestrian Partners, which commenced the project in January 2014, employed over 500 people to move 1.6 million cubic yards of earth, build five riding arenas with world-class footing, erect 500 permanent stables, lay over seven miles of fiber optic cable, create miles of walking and bridle paths, install utilities, and build over 20 permanent structures including several homes in the resort’s new Log Cabin Village. Tryon features a broad and deep history of equestrian culture and sport that spans over 100 years and includes Hunter/Jumper, Steeplechase, Cross Country, Carriage Driving, Dressage, Breeding, Young Horse Shows, Fox Hunting and the Western disciplines. It is also considered the birthplace of modern Show Jumping as it was the home of the 1956 and 1960 Olympic trials, as well as a key training ground for Show Jumping Legends George Morris, Bert Denemethy, Gordon Wright, and Frank Chapot. The historic area is home to a variety of cultural experiences, including vineyards, art festivals and charming villages. There is also nearby archery, fly fishing, hiking, mountain biking and climbing, white water rafting, sporting clays, tennis, ropes courses, a zip line park, kayaking, water- and jet skiing. In addition, there are five recreational lakes within 25 miles of the Resort and numerous hunting opportunities for outdoor enthusiasts. Tryon Equestrian Partners’ founding shareholders are Mark and Katherine Bellissimo; Roger and Jennifer Smith; Gwen and Howard Dvorkin; Lisa Lourie; Diana and Jenji Mercer; and Joe and Cindy Mitchell. Beginning on July 2, the Tryon International Equestrian Center will host the first of numerous multi-day, international-level equestrian competitions across several disciplines in collaboration with the Tryon Riding and Hunt Club. These events will complement the Tryon Horse Show, which is the third oldest horse show in the country. When fully completed, the equestrian facility will feature up to 10 riding arenas (including one with stadium seating for 6,000), 1,000 permanent stalls, elevated and shaded viewing decks, a large covered riding facility and the Tryon Sports Complex, which will include a health club, game room, kid’s camp, sports bar, children’s playground, tennis courts, mountain bike park, climbing walls, basketball court, and a large pool with private cabanas for participants’ families. Some of the Tryon Equestrian Partners are also principals in the Palm Beach International Equestrian Center, home of the world-famous Winter Equestrian Festival, which is the largest and longest-running equestrian festival in the world. The Festival generates close to 100,000 room nights for the area from January to March, as well attracting over 6,000 horses from 50 states and 33 countries. 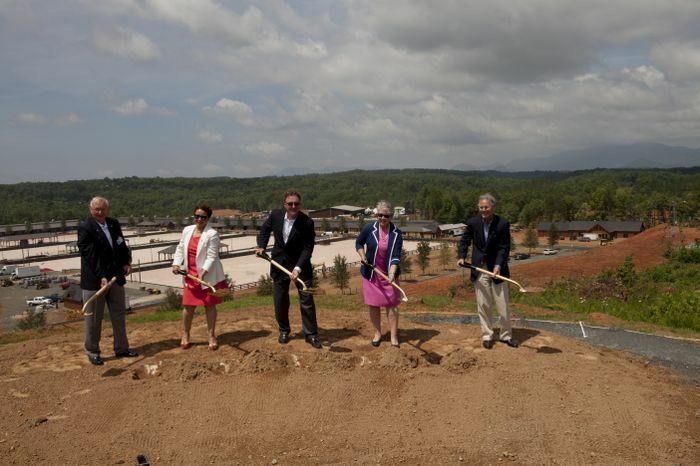 Bellissimo believes the Tryon Resort will be a significant contributor to the tourism industries of North Carolina and South Carolina, the border of which is only seven miles away. Tryon Resort is only an hour west of Charlotte Douglas International Airport, 40 minutes from the South Carolina region of Greenville and Spartanburg, and the same distance from North Carolina’s highly acclaimed City of Asheville. Directly located off US-74, it is extremely accessible by car and air, including the nearby private Rutherfordton airport and an on-site heliport. Tryon is located in a region known as the Blue Ridge Thermal Belt, which enjoys one of the most temperate climates in the United States and is generally free of dew and frost. Most outdoor activities are available on average 350 days per year. Located on and adjacent to the former White Oak Community, Tryon Resort features numerous accommodations for guests, competitors and spectators. Situated alongside the meandering White Oak Creek, the Log Cabin Village includes brand-new 2,600-square-foot, three-bedroom vacation rental cabins which are elegantly furnished and features laundry rooms. The new Tryon RV Park offers motorhome hooks ups for water, sewer, electric and cable TV, and a reception cabin with private bathrooms, laundry facilities, grills and picnic tables. The resort also offers private, multiple-bedroom, luxury homes available for rent. Perched above the equestrian show grounds and scheduled to open in 2016 is an architecturally stunning 150-room hotel being developed by Salamander Hotels & Resorts and designed by AW Architects. Built into the natural gradient of the land, and overlooking the mountain tops, it will feature numerous, spacious suites, a restaurant and bar with spectacular views, retail shops, market, indoor and outdoor heated pools, fitness center, beautiful event space for weddings and meetings, sweeping stone terraces, and a 5,000-square-foot entertainment pavilion with panoramic views of the countryside. Additional plans call for a luxurious resort featuring a world-class, nature-inspired spa, and spectacular dining and conference space set atop a panoramic vista; the completion of the Resort’s Arnold Palmer Signature Design golf course; and construction of new luxury homes – available for purchase and participation in the resort’s rental program. Each of these components will be managed by Salamander, which will also serve as the resort’s design architects. Extensive knowledge of luxury hotels and resort operations, equestrian culture and golf course management is what led Tryon Equestrian Partners to select Salamander Hotels & Resorts to manage the hospitality components of the Resort. In August 2013, Salamander launched one of the most anticipated hospitality projects in recent memory: the equestrian-inspired Salamander Resort & Spa in Middleburg, which is the historic heart of Virginia’s horse and wine country. Acclaimed as one of last year’s top hotel openings in the world, the 168-room property features an on-site equestrian center, miles of riding trails, spectacular spa and dining options, and is located just one hour from Washington, D.C.
Tryon Resort becomes the newest member of Salamander’s growing portfolio. In 2005, Johnson founded Salamander Hotels & Resorts and appointed long-time and visionary hospitality executive Prem Devadas as its president. They have put together a team of executives which has opened and operated numerous Forbes Five Star and AAA Five Diamond-rated properties. In addition to Salamander Resort & Spa in Middleburg, the company also manages three renowned golf and family resorts in Florida: Innisbrook in Tampa Bay, Reunion in Orlando and Hammock Beach in Palm Coast. Well known as one of America’s top entrepreneurs and the co-founder of Black Entertainment Television (BET), Johnson is also a partner and vice chair of Monumental Sports & Entertainment, which owns the NBA’s Washington Wizards, the WNBA’s Washington Mystics and the NHL’s Washington Capitals. For more information: visit www.TryonResort.com or www.TryonHorseShows.com. Salamander Hotels & Resorts is a privately owned and operated company based in Middleburg, VA, just outside Washington, D.C. Founded by entrepreneur Sheila C. Johnson in 2005, the company has a portfolio that features a collection of three stellar golf resorts including Innisbrook Resort near Tampa, Reunion Resort in Orlando and Hammock Beach Resort in Palm Coast; the luxurious Salamander Resort & Spa in Middleburg, a 340-acre equestrian-inspired property near Washington, D.C.; and the development of the new Tryon Resort in Tryon, NC. For additional information, call (540) 687-3710 or visit www.salamanderhotels.com.